This 2017 1/2 oz Canadian Gold Maple Leaf is produced by the Royal Canadian Mint (RCM) at its precious metals minting facility in Ottawa, Canada. The RCM 1/2 oz gold Maple Leaf has a gold purity or fineness of .9999, making it one of the highest purity gold bullion coins in the world. 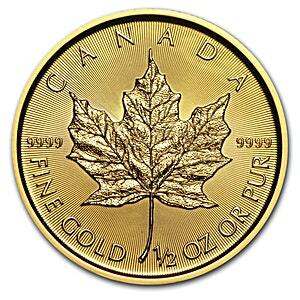 When the RCM first issued gold Maple Leaf coins in 1979 they had a gold fineness of .999 or 99.9% gold. 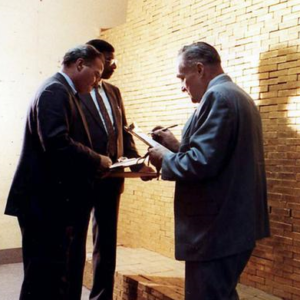 In 1982, the RCM increased the gold purity to .9999 gold and all gold Maple Leafs produced since 1982 are 99.99% pure gold. 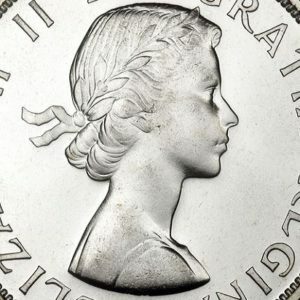 The obverse of the 0.5 oz gold Maple Leaf coin features a modern portrait of Queen Elizabeth II, Canada’s head of state, with the coin’s face value $20, and the year of manufacture, 2017, inscribed in an arc below. The reverse of the coin features a stylised Maple Leaf surrounded by the words ‘CANADA’ and ‘FINE GOLD’ ‘1/2 OZ OR PUR’, together with the gold coin’s purity 9999. The 2017 gold Maple Leaf features innovative high security details in the form of precision radial lines on both coin faces. As a fully-owned entity of the Canadian Government, the Royal Canadian Mint guarantees the purity and authenticity of every gold Maple Leaf coin leaving its production facility. Gold Maple Leaf bullion coins are very well known internationally and are popular across North American, Asian and European markets, with a highly liquid market internationally for buying and selling.